Ven. Neng Chao was born in 1944, in a family in Manzhou Village, Pingtung Country, Taiwan. Her birth name is Liu Fangqi. The youngest in the family, she has a brother and three sisters. Her father was a farmer, and her family lived a modest and simple life. So, her father often taught them with this belief and conviction in mind. As a Taiwanese saying goes, “Heaven is always watching what human beings are doing.” Thus, he taught them to take care of the natural world, cherish food, and follow the law of causality. In 1957, when she was 14 years old, causes and conditions ripened, so that she followed her mother to take refuge under Venerables Xing Kuan and Sheng Hai, who were based at the Yuquan Temple in Hengchun, Pingtung. Thanks to the compassion and kindness of the two Venerables, she was ordained by them in the same year, and given the Dharma name Neng-Chao and entitled Fa Hui. They taught her to follow the regular morning and evening chanting. Her teachers were strict, and so she learned to live a disciplined life. She was also taught to follow the Zen way of life - “One day without work is one day without food” – as inspired by Master Bai Zhang in the Tang dynasty. She has always kept this teaching in mind, to remind herself and to teach people to live a diligent life. In 1959, Venerable Neng Chao followed her teacher Venerable Xing Kuan and moved to Miaoguang Temple in the Shilin District of Taipei City. In February 1960, when she was 17 years old, her teacher sent her to study at the Tipitaka College, founded by Venerable Bai Sheng, who specialized in teaching the Avatamsaka Sutra. The teachings and studies at the College covered a wide range of studies, including Buddhist essentials as taught in various Buddhist Schools and sects, and moderate studies of history and geography. Since becoming the Abbess of Chengfo Temple, she has devoted herself to the task of spreading the Dharma. First she worked with Venerable Xin Tian to found the Voice of Buddhism, and started to spread the Dharma on air. She hosted Buddhist radio programs for more than decade, with an audience throughout Taiwan. She was also invited by various Buddhist centers to preside over seven- day Buddha name recitation retreats, and explain Pure Land methods of practice. She transmits and explains the Eight Precepts, and collaborated with Chairperson Yang Qiquan of Nanxing Recording Company to produce a whole set of Buddhist chanting, along with teaching cassettes recorded by the monastics led by the Venerable. In Focheng Temple, she provides regular group practice activities, celebrations for the Buddha’s Birthday, and Dharma services. Eight Precept and Seven-day Buddha Recitation Retreats are held every year, and she leads practitioners to take the Three Refuges and observe the Five Precepts. She organizes Buddhist camps and introductory classes to invite young people to learn about the Dharma. So, the Venerable promotes and spreads the Eight-fold Noble Path to inspire people to perform right actions, with an aim to improve people’s bodies and minds, and thereby achieve peace in their families and society. 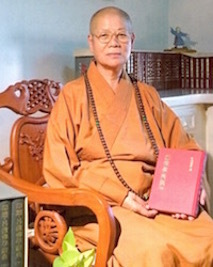 Venerable Neng Chao is now 73 years old, and has served as director and supervisor in Buddhist circles on their invitation, as well as, key positions at precept venues.